Russia's new space project, Venera-D, calls for a journey to the planet Venus in 2026. What do scientists hope to find on the solar system's hottest planet? The Russian Space Agency (Roscosmos) and NASA are discussing a joint project called Venera-D, which aims to land a space probe on the surface of Venus and spend several days conducting research there before eventually destroyed by the intense heat. The Soviet Union sent missions to Venus from 1961 to 1984, first landing there in December 1970. In fact, this was the very first time that the human race had ever landed on another planet. However, because of Venus' extreme heat the Soviet spacecraft survived no longer than two hours on the planet's surface. The new Russian mission, planned for 2026, hopes to set a record in terms of duration on Venus' surface. Russian scientists said that the E.U., the U.S. and China already expressed interest in participating. 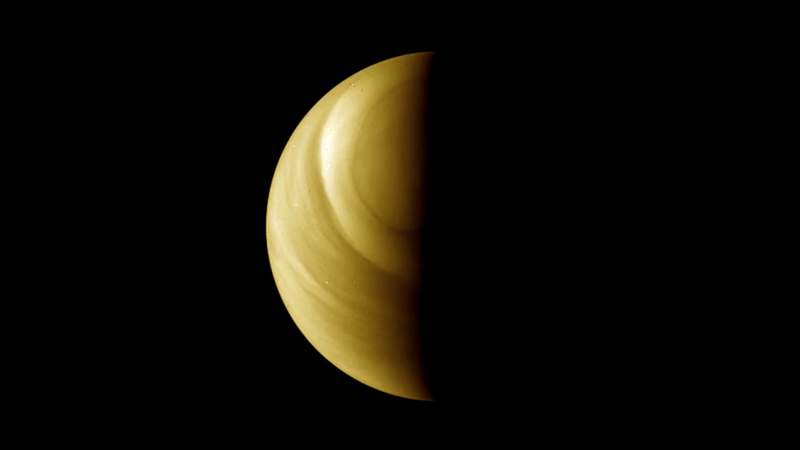 The comprehensive program for exploring Venus also includes the launch of atmospheric sounders and even an orbiter. Unlike Mars where water has been discovered, Venus doesn't offer any hope of life because it is a brutal desert. Surface temperatures can reach +467 Сelsius in the shade, and its surface is always in the shade because of a thick cloud layer. Light from the Sun can never get through. The atmosphere is practically pure carbon dioxide, and the pressure is 93 atmospheres, which is the same as deep under the Earth's oceans. The development of Venus' climate followed a catastrophic spiral -- rising temperatures led to the evaporation of primordial oceans, which in turn led to a thicker cloud cover that pushed temperatures even higher. In addition, Venus spins on its axis in the opposite direction. The Soviet Union's Venera-7 made the first ever soft landing on Venus in August 1970. Five year later another spacecraft, Venera-9, transmitted the first pictures from the planet's surface back to Earth. In 1982, Venera-13 sent back color panoramic images of Venus as well as sound recordings. Zeleny said that Russia has already set up a joint working group to repeat the achievement of Soviet scientists and engineers who in 1985 landed the Vega-2 spacecraft on Venus' surface. That probe will serve as a prototype for Venera-D.
Will Donald Trump embrace the International Space Station? Zheleznyakov said cooperation between Roscosmos and NASA will be beneficial and effective. Russian scientists can do the work related to the establishment of a portable research center aboard the spacecraft, while the Americans could ensure the spacecraft's durability since they have created materials that can withstand the aggressive environment of other planets.